BRONX (WABC) -- Ten men were arrested in the Bronx on Thursday for their alleged involvement in a drug trafficking organization. The arrests were made as a part of "Operation Green Giant," an investigation into an organization they say shipped approximately $22 million worth of marijuana from California to New York since early 2016. 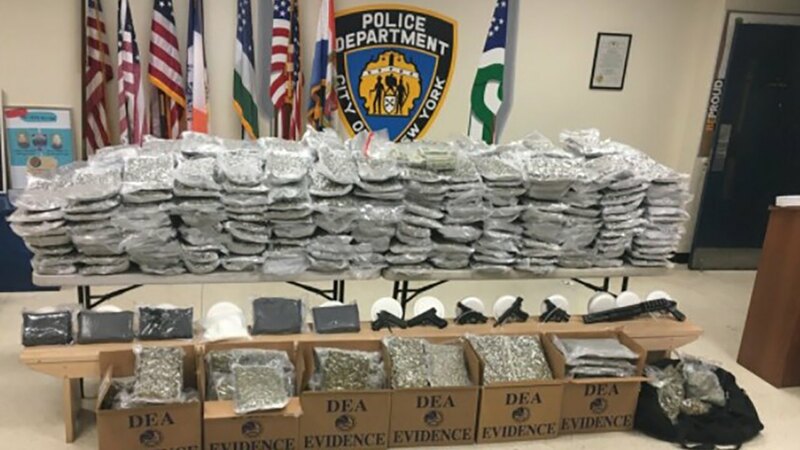 The over 6,600 pounds of marijuana was then supposedly dispersed between locations in Manhattan, the Bronx, and New Rochelle. Officials executed search warrants at 12 locations in the Bronx, where they found hundreds of pounds of marijuana, guns and ammunition, cocaine, and thousands of dollars. "Drug trafficking organizations endanger public safety, and today's multi-agency effort has successfully halted another such alleged organization," said Acting Manhattan U.S. Attorney Joon H. Kim. The investigation was carried out by the combined forces of the U.S. Attorney's Office for the Southern District of New York, the Drug Enforcement Administration, the Internal Revenue Service Criminal Investigation Division, Immigration and Customs Enforcement's Homeland Security Investigations, and the New York Police Department. All 10 of the men were charged with conspiracy to distribute marijuana, while one of the men, Lorne Victoria, was also charged with use of a firearm in furtherance of drug trafficking.